Presidents Day reflections typically commemorate the exploits of two of our larger than life chief executives whose birthdays we celebrate in February—George Washington and Abraham Lincoln. This piece instead assesses the contributions of a different American colossus—James Madison—and examines the War of 1812 as we observe the 200th anniversary of the treaty that ended the conflict, which the U.S. Congress approved on February 16, 1815. Madison’s image does not adorn Mount Rushmore, and he has no memorial in Washington, D.C. However, he played a pivotal role in devising the United States, especially in framing the Constitution and promoting religious liberty. One of the nation’s most cerebral and articulate founders, he served in numerous legislative bodies, including the Continental Congress and the House of Representatives. Madison penned the extremely influential Memorial and Remonstrance Against Religious Assessments in 1785 to argue for ending Virginia’s Episcopal establishment and providing complete religious freedom. Historians label it “the most powerful defense of religious liberty ever written in America.” No other founder had as much impact on the nation’s conception and practice of freedom of conscience and the separation of church and state. Madison was a Virginia delegate to the Constitutional Convention and led the effort to create a new constitution and to procure its ratification by coauthoring the Federalist Papers with Alexander Hamilton and John Jay. His contributions are so significant that Madison is often called “the father of the U.S. Constitution.” After eight years as Thomas Jefferson’s secretary of state, he served as a two-term president and directed the nation’s war against Great Britain and westward expansion. Like John Adams, Madison is revered more for his ideological and other political contributions to the United States than for his presidency. Scholars typically rank Madison as only an average chief executive. A major reason for Madison’s lackluster presidency was that America’s troubled relations with Great Britain that culminated in the War of 1812 dominated much of his time in office. The United States declared war on Great Britain on June 18, 1812 for three primary reasons: to stop the British policy of impressment, protect the trade rights of neutral nations during Britain’s war with France, and gain territory. Between 1790 and 1812, the British forced about 15,000 American citizens to serve in their navy. Many Americans wanted to drive the British out of North America to end Britain’s provocation of Native Americans and monopoly of the fur trade. Moreover, war could enable the United States to gain control of the West and even add Florida and Canada to the new republic. Britain’s crop failures, skyrocketing food prices, riots, and factory closures led the House of Commons to repeal its bellicose policy toward the United States on June 16, 1812, two days before the United States declared war on Britain. Diplomats sailed past each other on the Atlantic without knowing the messages their counterparts were carrying. If the federal government had subsidized merchants hurt by the Embargo Act of 1807 that prohibited trade with Britain and France during their war or simply had been more patient, some historians argue, armed conflict with Britain could have been avoided. In this war the United States, still a weak country with a small military, took on the world’s most powerful nation with its huge navy and well-trained army. This, coupled with misconceptions that America’s generals and militia were competent and that Canada was poorly defended, quickly led to embarrassing routs. After the disastrous invasion of Canada, American morale rapidly deteriorated, and contraband trade flourished. In August 1814 the British navy blockaded the United States coast, raided ocean-side cities, overwhelmed Washington, and burned many public buildings including the White House. Given the outcome of the war, the peace treaty was probably the best the United States could have obtained. The British had initially demanded that the Northwest Territory be given to Native Americans and that part of New England and New York be ceded to Canada, but the treaty simply restored the situation that existed before the war began. The United States lost most of the war’s battles and did not achieve any of its stated goals. 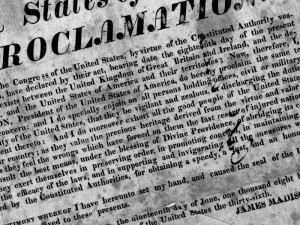 However, the announcement of the peace treaty, coupled with Andrew Jackson’s sensational victory at New Orleans in early January 1815, led most Americans to rejoice. The War of 1812 had many significant consequences. The United States became more economically self-sufficient by increasing its manufacturing, acquired Florida and the Midwest, and strengthened its army and navy, thereby discouraging future attacks. The nation’s economy quickly improved, and New England’s threat to secede from the Union dissipated. Because the United States was not decisively defeated, it gained greater respect and has never again been treated as a second-class nation. Dr. Gary Scott Smith chairs the history department at Grove City College, is a fellow for faith and the presidency with The Center for Vision & Values, and is the author of Faith and the Presidency From George Washington to George W. Bush (Oxford University Press, 2009) and Heaven in the American Imagination (Oxford University Press, 2011).